Sure, it looks unassuming. That’s the fun part. However, these little babies contain a surprise. Rich, creamy, clouds of yumminess reside inside. Well, you’re gonna have to make them yourself! I’ve tried emailing food to people before. Apparently that is not what the slots on my computer are for. First you’ll need some chocolate cuppycakes. You can use any though. Or a boxed mix. I’ll never tell. While those are cooling, make the filling. In your mixer, beat butter and sugar together until fluffy. Once cool, add the vanilla to the flour/milk milk and stir until fully combined. Then add the flour/milk/vanilla mix to the butter and sugar and beat until fluffers! Once finished, it will look like whipped cream, but be much thicker, as shown here with my upside down spoon of the stuff. I found this recipe on Tasty Kitchen. She uses it as icing. I don’t like it like that. It’s more of a filing. Well, in my opinion. You are free to have your own opinion. This is similar to, but the not the same as the filling in my whoopie pies. You’ll need 1 of 2 things here. Either a Pastry bag with large icing tip, or an apple corer and some patience. I have no patience, so I have a pastry bag. 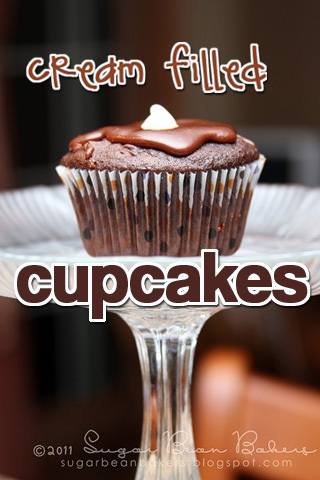 (if you have the corer, core out the middle of the cupcake, then fill with a spoon). This stuff tastes like melted fudge. It’s bad, but good. Sooooooo good. Then add the sugar and vanilla. Add 2 TBS water. If it’s not enough, add the 3rd. This should be runny, but thick enough to fully coat your spoon. Ok, now spoon it onto your cupcakes. You’ll not need to fully coat them (you might WANT to though). If you can wait that long! Otherwise, take a bite of the yummy confection you have just created. You can even share some. I won’t make you though. These look absolutely gorgeous Tina! Love the glaze that you put on top, too! I'm going to try that someday. Michelle, I use the same recipe without the chocolate when I just want a yummy vanilla glaze. I posted it today, I used it on the coffee cake. Very versatile glaze. THESE LOOK BEYOND DELISH!!!!! THANKS FOR SHARING AT WONKA WEDNESDAY! You might want to adjust your recipe just a little bit. Instead of saying thicken the milk/flour mixture, you should specify that it should be as thick as brownie mix. I have a friend who had never baked before that I suggested the recipe to and it turned out awry because he hadn't thickened his milk/flour enough. Good recipe, but being a little more specific might be helpful. OMG I love that frosting. I just made it for the first time last week and it was SO good. These cupcakes are gorgeous! Thanks for sharing them on Crazy Sweet Tuesday! I found this recipe on pinterest and am planning on using this filling for my cupcakes next week. CAn you tell me how many cupcakes it will fill? Allison, you should have more than enough to fill 24. I'd say maybe even 36.